securely fastened in the Blue Rock, at the Shipyard's Chinese Garden and Landing. 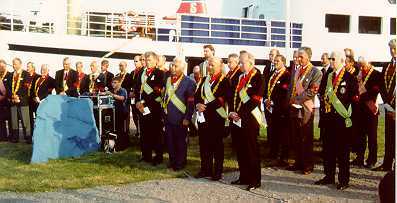 The Order of Coldin is an old Seafaring Order with medieval roots from the Mediterranean region. It was introduced to Sweden via France and England in 1755 and then also established in Finland. 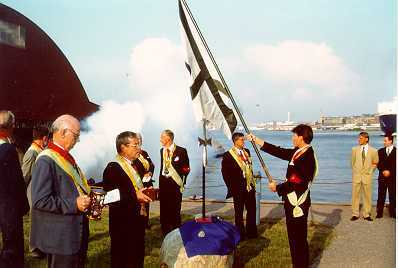 The tradition of the Order of Coldin to set ashore a cross, is an unbroken tradition from Prince Henry's maritime arsenal. Its navigational importance is today mostly of a modest nature, but the symbolic cross-planting remains as a tradition to this day. Prince Henry the Navigator (Portuguese: Infante Dom Henrique, o Navegador) was the steward of Sagres who was his residence in the then "Kingdom of the Algarve" on the southwestern part of the Iberian Peninsula. In the first half of the 15th century he established Portugal's first astronomical observatory and a sea arsenal. There he took care of the training of skilled sailors and mathematicians. 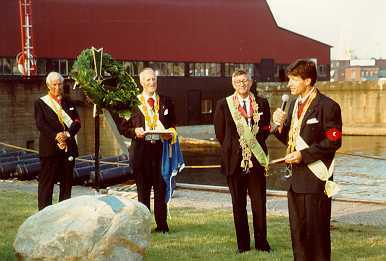 Almost every year, Prince Henrik sent expeditions to the south and the coast of Africa right down to Senegal and the Gambia. Madeira, the Azores and Cape Verde were also taken over. It was Prince Henry's merit that the Portuguese started their voyages of discovery, which after his death led to the discovery of the sea route to India. Crosses were set up as landmarks at sea expeditions and exploration trips, partly to show to other seafarers that the place was explored in one way or another, and that, where appropriate, it could correspond with maps that were continuously drawn and updated. At the various expeditions, there was always a representative from the church present, since it was by far the greatest worldly and spiritual power. The basic idea was to spread the Christian human message. One must not forget that during the Middle Ages, the "Holy See", that is, the Vatican City, exerted a great influence on all rulers of Europe's. The cross was therefore the natural symbol to set up to distinguish a place that was important for the navigation both on land and on the seas. In the beginning the crosses was made of wood, but these was destroyed too fast and when possible they were replaced by crosses of stone. Crosses was still not made by iron because the material was expensive and still relatively rare. The history of the iron cross begins only a few hundred years later when the material had become more common. On September 20, 1992, a cross was planted in the Spanish city of Palos de La Frontera, next to the well from which Columbus 500 years earlier fetched his water for the ships before his historic journey. The cross was blessed by Palo's Catholic priest next to the Order's Swedish Protestant Court priest. A few months later, the place was also visited by the Pope John Paul II and King Juan Carlos. A memorial plaque was made in four copies by the city. These were distributed to the Spanish King, the King of Sweden, the Pope and the Order of Coldin, to commemorate the celebrations. 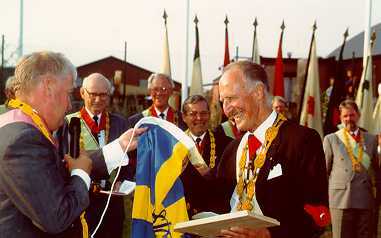 The origin of the Order of Coldin, as well as its previous history, lies - as clearly understood by the brethren of the Order - completely beyond the scope of a description of our branch thereof, which is called the Göta Coldinu Order. The Order is a brethren's union, whose first origin is traced to a distant time and a faraway country. It is now only found in Sweden and Finland and was introduced in our country in 1765, when Baron Carl Björnberg in Stockholm founded the first lodge, which was called Arla Coldinu Orden. Baron Björnberg had himself been admitted as a member in this order in 1755 aboard an English ship by an Englishman named V:m Bird in the Port of Gothenburg. Two years later, on the French warship Belle Isle, which was at the Gothenburg's rescue, he was first promoted to higher degrees by the French warship captain Thurot and subsequently provided with proper authorization to set up Coldin in Sweden as A-n R-r. Following his instruction, Baron Björnberg initially adopted five members namely in 1757 auditor Christoffer Cedergren and regiment pastor Anton Grimbeck in Gothenburg, in 1761 the protocol secretary Johan of Bjerchén in Stockholm and in 1753 the chamberlain, free-lord Knut Leijonhufvud and the captain, free-lord Carl Fredrik Leijonhjelm, the latter both at Sveaborg in Finland. In 1764, Björnberg began to equip Arla Coldinu Orden, which on May 8, 1765 could be inaugurated, and thus become Stam Coldin in Sweden; In 1766 he founded at Sveaborg a lodge, which was named Moon's Coldin. Its first governor became free-lord Leijonhufvud. In 1769, Kronans Coldin was established in Karlskrona.